Impressively directed and sharply written, this is an engaging and frequently very funny comedy-thriller with a terrific central performance from Brendan Gleeson. 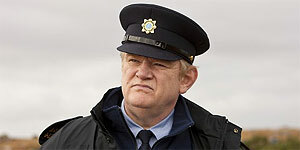 Directed by John Michael McDonagh (the brother of In Bruges director Martin), The Guard stars Brendan Gleeson as Sgt Gerry Boyle, an unconventional small-town cop on the West Coast of Ireland. When a local murder appears to have connections to a gang of international drug traffickers (Liam Cunningham, Mark Strong and David Wilmot), Boyle is forced to team up with FBI Agent Everett (Don Cheadle) and the two men gradually form a grudging alliance. However, catching international drug traffickers is the last thing on Boyle's mind, as he has his own problems with hookers and drugs. On top of that, he also has to deal with his ailing mother (Fionnula Flanagan) and a troublesome case involving the missing husband of a young Croatian woman (Katarina Cas). Gleeson is fantastic as Boyle, relishing every line and maintaining an intriguing balance so that, like everyone around him, we can't tell whether he's a genius or an idiot. At one point, Cheadle's character says more or less exactly that and the look on Gleeson's face is worth the price of admission alone. In addition, there's reliably great support from Liam Cunningham and Mark Strong, while Cheadle proves an excellent comic foil and there's a hilarious cameo from Pat Shortt as a not-too-bright ex-IRA man. The script is frequently hilarious, particularly in the first half of the film, which has a lot of fun with cop movie clichés like police briefing rooms and crime scenes; there are also several very funny running jokes, most notably Boyle's constant digs at American cops and cop shows. That said, it's only fair to point out that the film meanders in the middle section and probably works better as a character study than it does as either comedy or thriller, though it still delivers a satisfyingly action-packed climax and the ending will leave you smiling. In short, The Guard is an enjoyable, well written comedy-thriller with a dark sense of humour and a terrific central performance from Brendan Gleeson. Recommended.